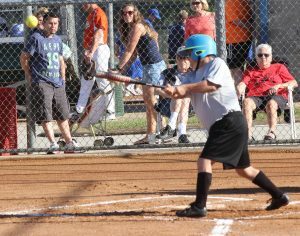 The State Softball Tournament — Special Olympics Kentucky’s second-largest team sports event — is set to hit the diamonds at Michael O. Buchanon Park in Bowling Green Sept. 7-9. This will be the 10th consecutive year Buchanon Park has hosted the Tournament. There will be more than 600 athletes competing on 34 teams vying for state championships in nine divisions at the Tournament. Games are scheduled to get underway on Friday, Sept. 7, at 6:15 (CDT) with games to follow at 7:30 and 8:45. Activity resumes on Saturday at 9 am, with games starting through 3:15 pm. Championship Sunday play opens at 9 am, with the latest games scheduled to start as late as 2 pm if needed to determine the winners in double-elimination formats. The Team Skills Competition will take place Friday Night beginning at 7 pm. The weekend’s events will also include the annual victory dance, held on Saturday night. The State Softball Tournament is sponsored by Special Olympics Kentucky year-round partners Delta Dental, Texas Roadhouse, Toyota Motor Corporation and Law Enforcement for Special Olympics Kentucky. It is supported by the Bowling Green Parks and Recreation Department and the Warren County Parks and Recreation Department. For information about the State Softball Tournament or the Special Olympics Kentucky softball program, or to find out how you can get involved, contact Hunter Brislin at 800-633-7403 or hbrislin@soky.org.